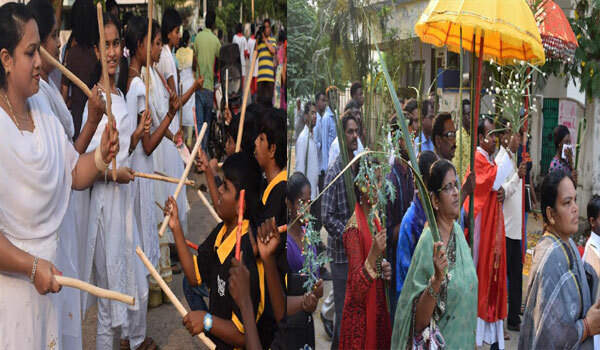 Christians took out processions holding palm fronds in different parts of East Godavari on Palm Sunday. Hundreds of Christians, young and old, participated in the processions, singing hymns marking the beginning of the holy week and in commemoration of the entry of Jesus into Jerusalem, ahead of his crucifixion on ‘Good Friday’. 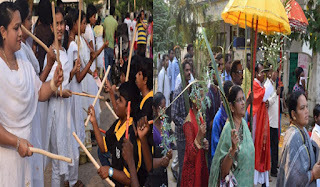 Christians who were on 40 days lent since Ash Wednesday on March 2 to prepare for Easter with penance and prayer, offered special prayers in churches after taking out the processions.Believers took out processions, holding blessed palm fronds and crosses made of the tender coconut palm leaves, was the major attraction of the Palm Sunday celebrations at various churches. Palm Sunday, often referred to as ‘Passion Sunday,’ marks the beginning of Holy Week which concludes on Easter Sunday. According to the Bible, when Jesus entered Jerusalem, the crowd greeted him by waving olive branches and by covering the path en route with olive and palm branches.To mark this event, Palm Sunday assumes the significance of distribution of palm leaves often tied to Cross to the worshippers in churches. Special services were held by Rev. Fr Varghese Jose, Parish Priest of Sacred Heart’s Catholic Church, in Kakinada. He blessed and distributed palm fronds to the faithful, and later they had a procession from Convent of Missionaries of Charity (Mother Teresa Sisters) to RCM catholic church, with laying of saris on the path as a mark of respect to welcome the King of Kings Christ Jesus, added to this the Indian traditional dance of Kollatam was performed by the team of dancers Ginu, Premelatha, Vasanta, Deepthi, Minu, Sailaja and warriors of St. Johns team.